More than 10,000 Gazans riot along security fence with Israel. One soldier injured by grenade shrapnel. More than 10,000 Gazans rioted along the security fence with Israel on Friday. They threw grenades and explosives and attempted to infiltrate Israel. Grenade shrapnel hit a combat soldier, injuring him. In response, an IDF aircraft carried out several strikes in northern Gaza, said the IDF. 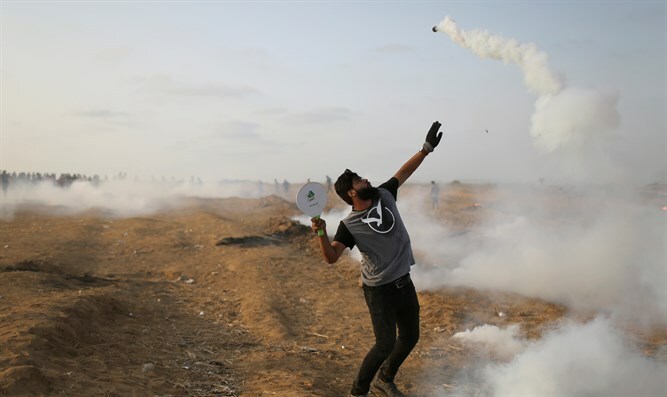 The Hamas-run health ministry in Gaza told AFP that one Palestinian Arab was killed by Israeli fire in the clashes along the Gaza border. A spokesman for the ministry claimed that the man was killed during protests east of Gaza City. More than 100 other people were wounded, the spokesman said. The so-called “March of the Return” border riots have been ongoing every Friday since March 30, but in recent days have become more frequent. Over the Yom Kippur holiday on Wednesday, dozens of Arab rioters infiltrated into Israel across the Gaza frontier, as terrorists attacked Israeli soldiers with firebombs, a grenade, and explosive device. According to an IDF spokesperson, there were multiple incidents and several locations along the Gaza-Israel border during the holiday. On Thursday, an IDF aircraft attacked a terrorist squad in northern Gaza that launched incendiary balloons towards Israel. Earlier, an incendiary balloon exploded in one of the communities in the Sdot Negev Regional Council.